Visit ancient ruins and a scenic waterfall on a full-day tour from Alanya to the Greco-Roman city of Aspendos, Kursunlu Waterfalls, and Side. You’ll see a beautifully-preserved Roman amphitheater, temples, and a nymphaeum, a fountain dedicated to the Greek nymphs. This tour includes hotel pickup and drop-off in Antalya, as well as a Turkish lunch and entrance fees at all locations. Meet a guide at your centrally-located Alanya hotel, then board a climate-controlled coach for the 58-mile (94-km.) trip to Aspendos. Explore the ruins on your own, which are listed as a tentative UNESCO World Heritage Site, taking in aqueducts, temples, and the spectacular Roman Amphitheater, a landmark built under the rule of Marcus Aurelius. The next stop is Kursunlu Waterfalls, where you’ll find the picturesque cascades wrapped in a pine forest. Photograph a historic mill, descend a staircase to the waterfall, and watch for the turtles and trout that can be seen just below the surface of the water. Visit a restaurant for a lunch of salad and fish, chicken, or pide, a kind of Turkish flatbread, then tour the nearby leather and jewelry shop (this is the perfect place to pick up unique souvenirs from the area). After lunch, continue to the ancient ruins of Side, a sprawling site with well-preserved walls, an agora, or public square, Roman baths, and more. Take in Side's landmarks, from ancient Roman temples to the nymphaeum spring. Following your time at Side, begin the return trip to Alanya, where this tour concludes with drop-off at your hotel. 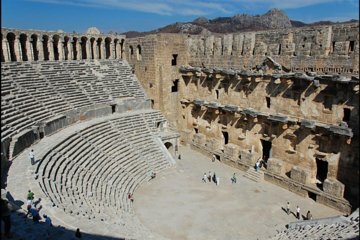 The reason I have given this tour 3 stars is mainly due to the magnificence of Aspendos. I was disappointed when we got on the coach to be informed we were not going to Kursunlu but to Mangavet falls as these are not really water falls with any height and more a river side coffee stop.. I believe that as we travelled later in the season the tour company mixed and matched different tours sold at different hotels. As we had purchased this tour online we were clear on what schedule we had been promised. That aside our tour guide was knowledgeable and the tour was fine. I would however strongly recommend Aspendos - truly spectacular!